As the poet Tom Petty once said "Waiting is the hardest part", and it seems like I had to wait forever for the Sharpie Pen in medium to show up on my local store shelves. I noticed them at Wal-Mart a month or so ago, and of course I couldn't help myself in picking up a few 2-packs. After reviewing the original Sharpie Pen, the Sharpie Pen RT, and the Sharpie Pen Grip, I have come to a pretty clear pecking order in which one I prefer. The original Sharpie pen is still my personal favorite. I reach for the Grip on occasion, but I always find myself going back to the original. I think it is the visual aspect of the long needle tip that I like so much. The RT isn't in the conversation at all. In fact, I think I have given most of them away. I never could get past some of the funky barrel design aspects, but most importantly, the tips of the RT seem to dry out extremely fast. The medium tip has been a real pleasure to write with so far. While I prefer the finer line of the original, the medium lays down a beautiful dark line. The tip is very firm also, which I like a lot. It reminds me of some of the larger tipped Sakura Pigma Microns. Have you had a chance to use all of the new Sharpie Pen products yet? Which one do you prefer? 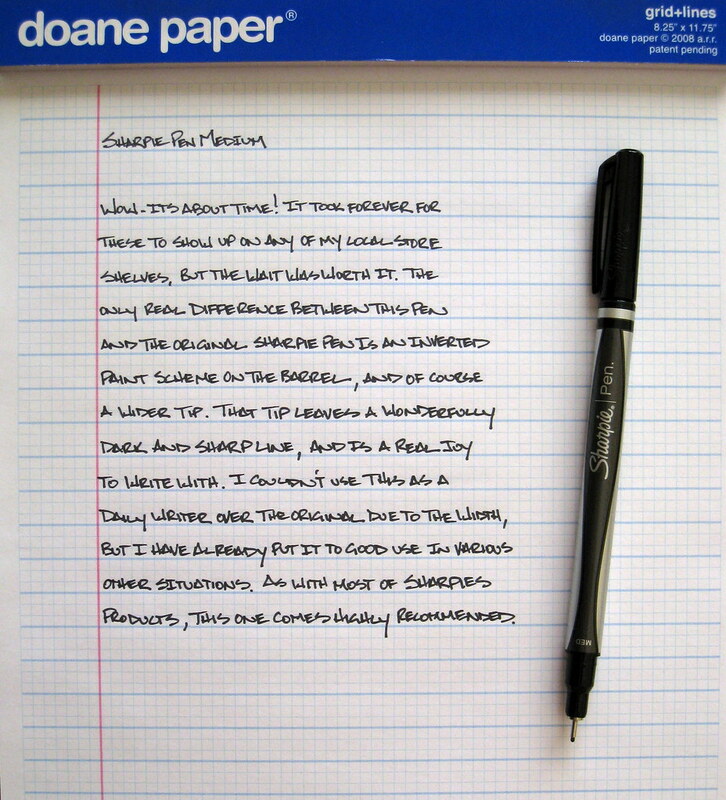 Posted on November 19, 2010 by Brad Dowdy and filed under Pen Reviews, Sharpie Pen.